Home » wearable » Dr. Chang Publishes New Journal Article "Video Recording the Surgeon's Viewpoint Cheaply"
Dr. Chang Publishes New Journal Article "Video Recording the Surgeon's Viewpoint Cheaply"
An avid snowboarder, I purchased one of those helmet-mounted video camcorders in order record my athletic feats over a year ago. 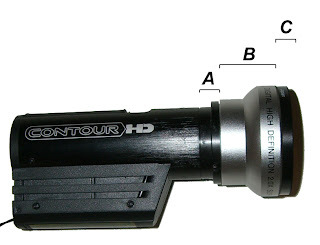 The one I purchased was called ContourHD and it can be mounted on the snowboard helmet and set to record by the press of a button. It was at some point boarding down a black diamond trail that I had an epiphany... Why not use this helmet mountable camcorder in order to record surgical procedures in the operating room? And... So I did with a few modifications to allow magnified narrow-angle shots... And I wrote a paper on it which was recently published in ENT Journal in March 1, 2011. In any case, below is a picture of my creation mounted on a surgical headlight. Read the article here (free registration required). Pubmed link is here. See the full list of publications by Dr. Chang here.